The grid below shows the street layout and resident locations on Plate 71 where we will target our research. The boxes mark the 104 Saint Louis residents listed at the bottom of Plate 71 and living in close proximity to the location of Central Presbyterian Church in 1875 at the northeast corner of Lucas Garrison Avenues. 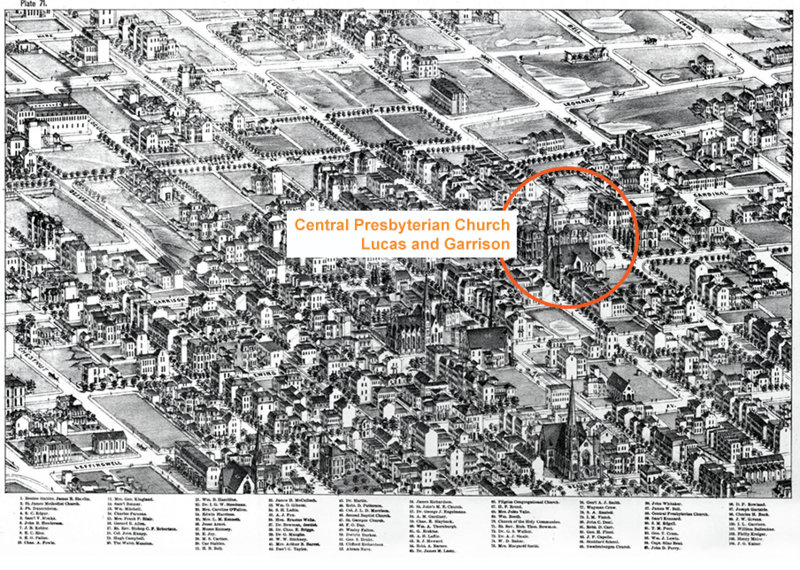 Number “88,” located in the lower right quadrant of the grid below represents the location of Central Presbyterian Church in 1875. North on this grid, as on all of the Dry and Compton plates, is on the right side of the graphic. The numbers on the “x” and “y” axes represent the block street numbers. Then, as now, North/South street numbering starts at Market Street and the numbers increase going north. East/West Street numbering starts at the river and numbers increase going west. The river is 27 blocks east of Beaumont. 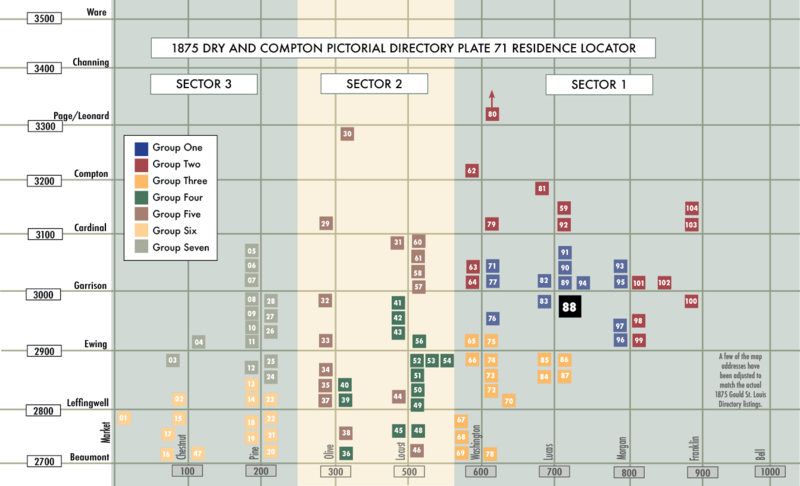 The 104 resident locations listed on Plate 71 of the Compton and Dry Map Book are shown on the grid above based on their relative location to the intersection of Lucas and Garrison and Central Presbyterian Church. The numbers on the grid and list below reference the resident’s name and location on Plate 71. On the list below they are shown with their actual addresses from the 1875 Gould St. Louis Directory. 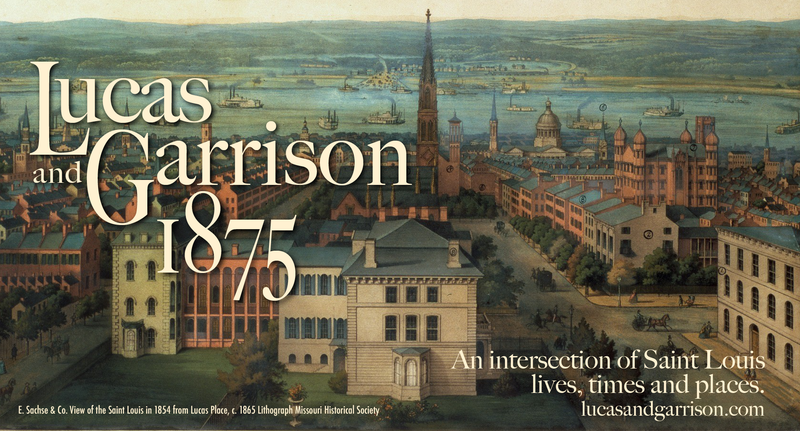 Each Lucas and Garrison resident profile researched is or will be presented on its own web page. For the sake of organization and presentation, the 104 residents are first divided into three sectors, designated by the shading shown above. Sector one includes addresses closest to the intersection of Lucas and Garrison and sections two and three are located more to the south. (North on all the maps is to the right). Each sector is then divided into groups of between 12 to 15 residents. 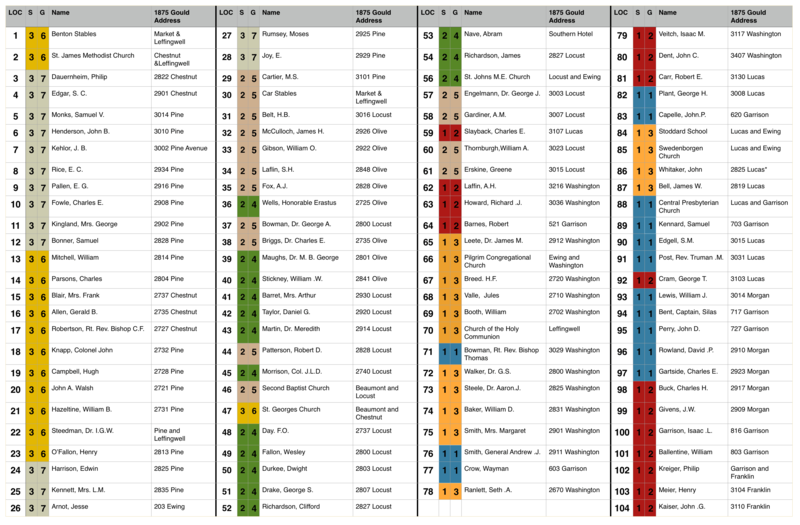 On the master list below, each name and address is shown with a Sector number (S) and Group number (G) and is color coded. Each group has its own web page and map which is listed under the St. Louis Profiles tab on the navigation bar. That group’s resident profile buttons include the resident’s name, address and the extra information (rabbit trail/s) researched for that resident. Tinted resident profile buttons are live links to completed profile pages. White profile buttons represent targeted residents in the sector and group that are still being researched. For example, Central Presbyterian Church is designated by the No. 88 on the original Compton and Dry Plate 71 and on the grid above and list below. That location has been assigned to Section 1 and Group 1. Accessing the Section 1 – Group 1 link under the St. Louis Profiles tab on the navigation bar takes you to the Plate 71 – Sector 1 -Group 1 page on which are included the group’s profile buttons. Clicking on the Central Presbyterian Church profile button takes you to its page.